Quinta da Sancha (Sancha's Farm) is a lush south facing valley overlooking the Village of Sortelha 2 km in the distance. 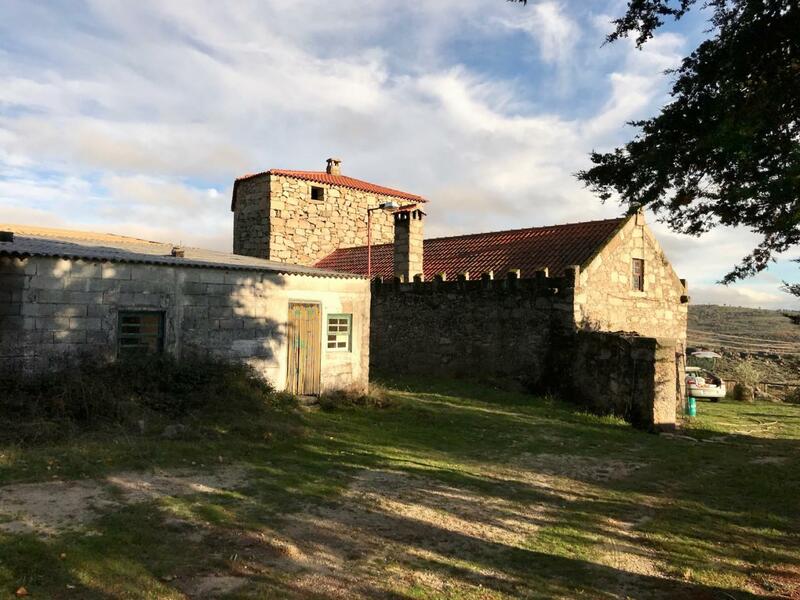 With an area of 15 Hectares, it is located in the Beira Alta region of Portugal, a short distance from the Serra da Estrela. This is an area that benefits from a microclimate favourable to agriculture due to its fertile land, abundant water and flat and mountainous terrain. At the highest point of the land there are Buildings that could already sleep ten to twelve faeries with the possibilities to house so many more, with some work on the barn. From the main house which is partly built around an immense boulder one comes out onto the open walled herb garden with a wood oven that overlooks the rest of the land and beyond. From there one can see the staggered fields (perfect for camping) leading further down the valley shrouded here and there by the communities of trees that surround the water holes. Banked on both sides by beautiful and staggering rock formations it is protected from the winds making it perfect land for growing food. To the right and atop the rocks stand four windmills, making a beautiful and soothing sound as they collect clean energy from our planet. When ten faerie explorers stepped onto this land to explore its potential for sanctuary the experience was palpable, unlike other places visited, it felt powerfully connecting and alive. There was a sense of magic and wonder in the air even though it was a cold, wet miserable cloudy day. Their experience of this place and its deep call to their hearts has led to the beginning of the Alto das Fadas sanctuary, a new and sacred space offering so many possibilities, many of which are yet to be dreamed or discovered. * Please help us to make the dream a reality and donate at our fundraising page. * You can join hands during the pioneer weeks or through other material contributions and non-material support - making the house and land welcoming for the future gatherings. * For more info on Alto das Fadas and the story behind the new land - read out blogs with more detailed information and a current development of the project. – Old house dating back to 1950, recovered consisting of ground floor, and 1st floor. Ground floor with equipped kitchen, living room with fireplace and bathroom with whirlpool bath and dispensing. First floor with 2 bedrooms, living room, office and storage area. – In the main house there are also 5 suites, living room and kitchen with fireplace and terrace with mountain view (works with finishes to finish). – With installation for central heating. – With porch and wood oven (dated 1950). – Ground floor with fitted kitchen, 1 bathroom, 1 bedroom, living room (needs some interior renovation). – Does support for housekeeping and some repairs of farm equipment. (former cowshed), drinkers, with an area of 700m2. – Inside the property there are several water springs, 1 water intake hole, 2 drinking water wells, 12 crucial dams in the water supply to the agribusiness to be installed. – With several areas for installation and creation of various animal species: ducks, rabbits, chickens, chickens, pigs, cattle, goats, etc. – Comprising 3 housing buildings, garage, warehouses, annexes, park, house of the pumps, orchard, mini-forest, pastures etc. – With excellent conditions for compliance with a set of requirements determined by the Common Agricultural Policy (CAP) at the level of: Environment, Biodiversity, Energy, Water, Waste, Toxicity, etc., which are determinant for the Legal Requirements of Management (RLG), guaranteeing the exploitation of their annual compensation. – This property extends over an area of 15ha, bordering other properties where the activities of horticulture, fruit growing, viticulture and animal husbandry predominate. – In addition to the potential for investment in both agribusiness and rural tourism, the farm has buildings and habitable infrastructures that can be classified as an added value. Property elevation is about 700m above sea level. Located east to Serra de Estrela (the highest mountain in mainland portugal around 2000m high), which creates a microclimate of warmer and drier weather. Still the annual precipitation is about 1000mm a year (similar to Lure) mostly between September to June. Winter temperature is rarely going below zero which makes the area ideal for agriculture all year long. Snow can occur but usually melt within few days. Summer is very hot and dry in the months July and August. The temperatures decrease quickly from September onwards and the rain season starts again. Recent forest fires haven’t affected the region and in general forests are quite scattered so the risk is low. Regarding climate change there is no consensus among studies on how global warming will affect this specific region, but it seems that most models do not predict radical change. Saturday, 26 January 2019 Alto das Fadas. Em que ponto estamos. Culte de Ach ? Hein ? Looks amazing! Thanks to all who have been working on this. The house built in to the boulders is so amazing. HOORAY! Is it okay to post the pictures and/or text on Faerie Camp Destiny's facebook group, or do you want to keep all info away from Facebook? Flood we prefer to share the FaeNet link on Facebook rather then post the actual content there..
okay thanks. I have an account that's just for faerie friends, kind of an inadequate precursor to this marvelous site.